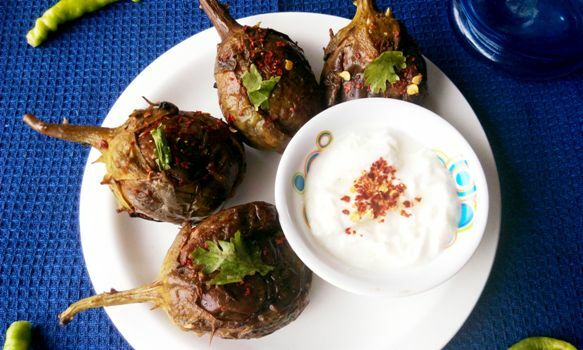 I am a big fan of Brinjal/Eggplant.Serve it in any form and I will eat the whole serving by myself. So I have to keep searching ways of feeding them this versatile veggie.This stuffed eggplant is one such attempt. This dish is very popular in north India.A very old recipe of my mother.And I am so proud to put it on blog as it has been in my family for generations. For making stuffing:take a large frying pan.Add vegetable oil in the pan and keep it on high heat.Add chopped onions in the pan and saute them till golden brown. Add ginger garlic paste to the onions and cook till raw smell of garlic goes away. Now add fennel seeds,red chilli powder,turmeric powder,coriander powder to the pan.Mix well and keep stirring.Now add water to the mix and let it cook on high heat for 2 to 3 minutes till water evaporates. Now add salt ,dry mango powder and garam masala.Mix well.Cook for 2 minutes and take it off heat and let it cool. 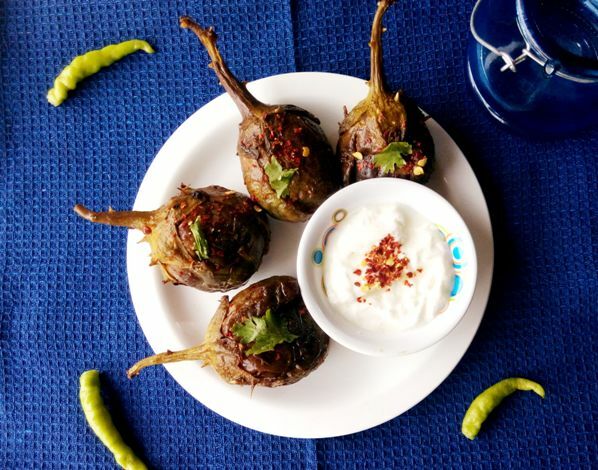 Now take the brinjals.If the stems are green and fresh,Keep them otherwise chop them off.Slit the brinjals in a shape of cross .But dont let the knife pass completely through it.This way we are making space to fill the stuffing. 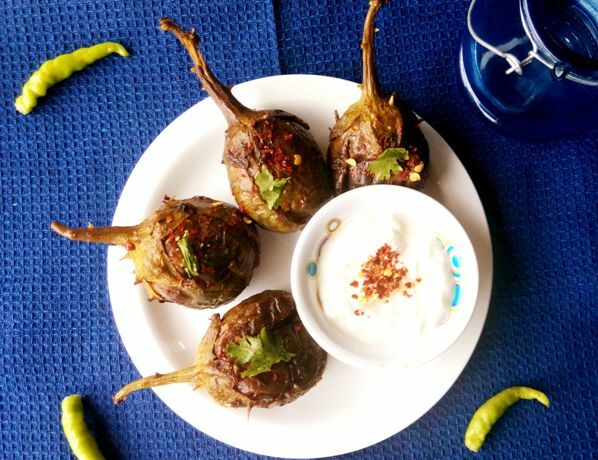 With the help of spoon,fill the stuffing in each brinjal. Take the large frying pan again,put vegetable oil into it.Keep it on low flame.Add bay leaves to the pan.Place brinjals in frying pan,well spaced and now add water to the pan.Cover the pan and let it cook for 25 minutes.After every 5 to 8 minutes,open the pan and flip the brinjals so as to avoid charring. Once the brinjals are all soft and look perfectly roasted ,take the pan off heat. I love stuffed produce and these eggplants are particularly beautiful. This shape isn't the most common in the US. I see them occasionally and always wonder what to do with them. Besides take pictures because they're just so pretty. Finally found a way to prepare them! Thanks for linking up at #SaucySaturdays. 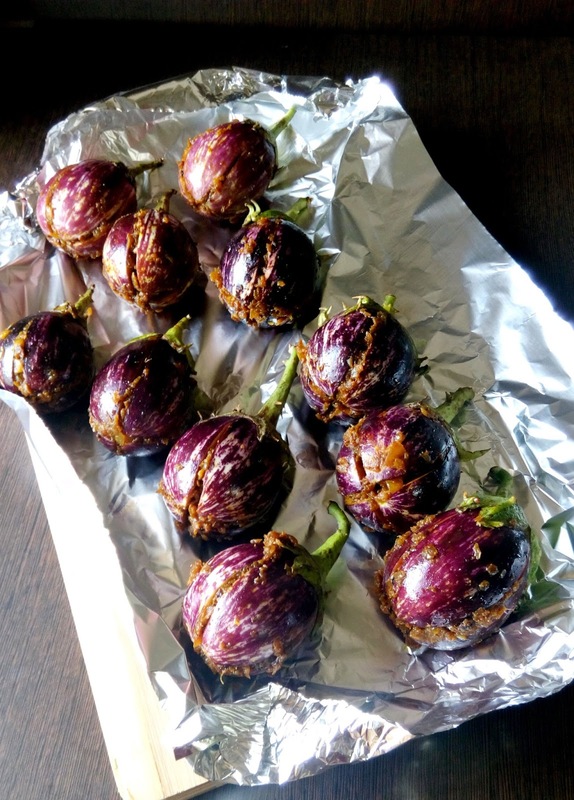 Good to know that now you will try making stuffed eggplants,Christine.You can make this in any shaped eggplant.And thanks for a wonderful linky party.